San Francisco multimillionaire, Elias J. "Lucky" Baldwin started a "gold rush" in 1874 when he constructed a large 40 stamp mill at the base of "Gold Mountain." His stamp mill roared to life in March of 1875 a mining town called Bairdstown, with 2 saloons, a butcher shop, and 2 boarding houses had sprung into being nearby at Baldwin Lake. The amount of gold recovered from Gold Mountain, however, fell far below expectations, and "Lucky" Baldwin shut the mill down after only seven months of operation. The little town quickly was deserted and became a ghost town. 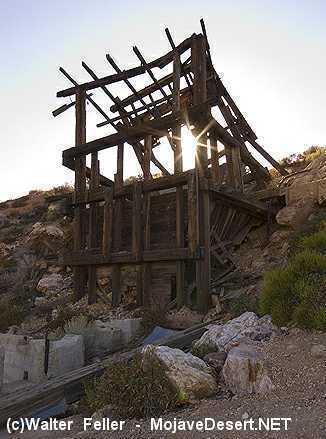 The stamp mill sat idle until it caught fire and burned to the ground in August of 1876. In 1899, Baldwin and a man named "Captain" J.R. DeLaMar struck a deal to build a new 40 stamp on the hill above the original mill. DeLaMar wanted to try a new cyanide process that would dramatically increase the amount of gold recovered from the low grade ore. By September of 1900, the new stamp mill was running at full capacity, and recovering over $4,000 a week. A little town named Doble grew at the foot of Gold Mountain while the mill was in operation. Gold became harder and harder to find though, and by 1915 most people had moved away. The mill ran about 20 years altogether until the cost to recover the precious metal exceeded profit.